Doesn't this card just make you want to go sit on a beach?! It looks so peaceful and inviting! 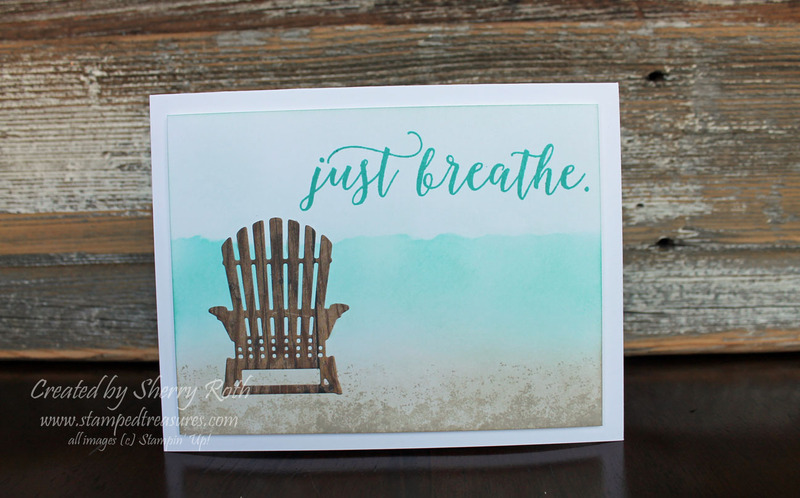 I think I've said it before and I'm sure you will hear it again - I love this Adirondack chair! I wonder how many people have purchased this framelit set for the chair. That was the initial reason for my purchase but now that I've been using it like crazy, there are many reasons why you need this bundle of products! I have seen many versions of cards like this one on Pinterest but I think this one resembles one created by Lyssa Zwolanek. There are so many options to create the background - patterned paper, a brayer or sponging, as I've done here. I love the soft look of the sponging. To add a bit more dimension to the sand, I used one of the images from the Timeless Textures stamp set and I love how it turned out! Hopefully the beaches of Thailand will look as beautiful as this!